• The finger-nose test. This involves observing the speed, smoothness and accuracy of the movement and whether any tremor occurs. • Rapid alternating movement of supination and pronation of the forearm. This test is usually performed more quickly on Ihe dominant side. In the lower limbs, tests include the heel-shin test and the heel toe test of gait. Additional tests that provide complementary information about the cerebellar function involve testing for truncal ataxia, assessing speech for dysarthria (p. 195), checking for nystagmus (p. 203), hypotonia (p. 217) and the presence of pendular reflexes (p. 221). 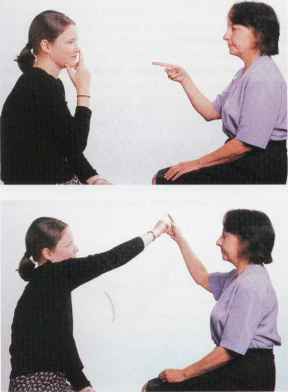 □ Ask the patient to hold one arm outstretched and then, with the tip of the index linger, to alternately touch the tip of the nose and then the examiner's fingertip as accurately as possible (Fig. 6.41). 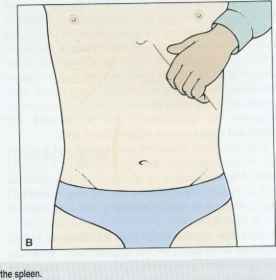 □ Perform the test with the patient's eyes open and test each arm in turn. Fig. 6.42 Testing rapid alternating movement. □ Make the lest more discerning by moving the target fingertip so that the patient has to readjust 'aim'. 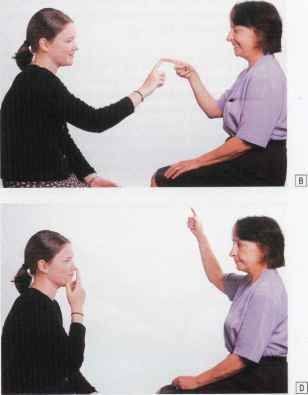 □ To test for ataxia due lo proprioceptive deficit (sensory ataxia), now ask the patient to bring the outstretched fingertip to touch the tip of the nose with the eyes closed. □ Ask the patient to place one palm upwards and then alternately hit the upfacing palm with the palmar and then dorsal aspects of the fingertips of the other hand as quickly as possible (Fig. 6.42). □ Ask the patient to raise one leg at the hip and then place the heel of the flexed leg on the contralateral knee and to then run the heel down the surface of the tibial shaft towards the ankle and then back again (Fig. 6.43A and B). □ To render the test more complex ask the patient first to raise the leg and touch the examiner's finger held in a suitable position with the big toe before placing the heel on the knee. □ Perform this test with the patient either barefoot or wearing flat shoes. □ Ask the patient to walk along a straight line so that, in turn, the heel of one foot conies directly in contact with the toes of the other foot. □ Observe the gail in general, and in particular nole any tendency to stagger and the side to which the patient preferentially falls.